Nothing is static, everything changes. Somebody, or a group of somebodies, wants to improve, alter, or refine something, and by doing so, the way we do things change as well. It is evolution. 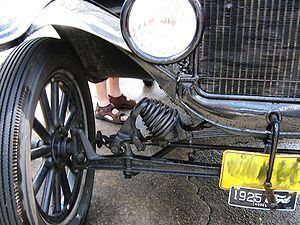 We no longer have to crank the engine of an old Model T Ford, then get back in the car to drive. Apparently Google is changing things and in six to twelve months keywords will not drive their search engine. Instead Google will be driven by ‘semantics.’ Having an English degree, which means I have a dictionary to look up words, I can tell those of you without a dictionary that semantics is the study of meanings in language. I am taking a leap here, but if algorithms and code is the language of search, then Google is refining the ‘meanings’ of its language. Admittedly I am out of my league in talking about semantics as driving a search engine, as I am out of my league on most everything. I am basing my thoughts on what I have read in a couple of blogs. But what I have read indicates that what you create in terms of topics, relationships, sharing, comments, and connections is what drives your score. Spamming is out. If you have a website, a blog, are in a Google community and have a Google account you can become a mover and shaker, especially if you post pictures, have videos, get lots of comments, and have a good spell check. It is also implied that it is not the number of friends or followers you have, but the quality of those friends; friends by the way, that we never see or truly know, only connect with superficially through electronic blogs and websites. Our friends, yours and mine, could be, for all we know, child molesters, serial killers, or Boston Red Sox fans. But somehow Google will determine the quality and influence you and me. In fact I have read that Google is now watching us through our network neighborhoods. They are the new Big Brother on the block watching what we do. Before long Homeland Security will take notice and team with Goggle in their own semantic search. The point being is that what I read sounds like the most popular people will drive searches. I suppose the good news is that the most popular people will no longer be football players and cheerleaders, but nerds. I was not a football player and am not a nerd, so once again I will be on the outside looking in. I can post pictures, hire people to post comments, write well-though I am not sure that counts-but by the time I figure out how to post videos I will be senile, if not falling prey to Alzheimer’s, which by my calculation will be next Tuesday. I wish the future well. I think though, I will change my keywords, using the same ones, whether in this blog, my baseball blog http://ballsandstrikes.mlblogs.com/ or my website http://terrynelson.net/. I will use topics, relationships, sharing, comments, connections, Goggle, Google plus, and of course semantics. I just want to be popular like you.